Time to add some REAL texture to the blanket with the Bobble Crochet Stitch. This is the fourth block in the Crochet Stitch Sampler Baby Blanket CAL Sponsored by Red Heart Yarns and hosted by Marly Bird. I chose the Bobble Crochet Stitch square for this blanket because I wanted to add a rich textured stitch to balance the other two really textured stitches. The stitch pattern of this stitch makes it so the bobble is off set every other row. By doing so we get a very symmetric look. Dc5tog (Double crochet 5 together): (yo, pull up a loop in indicated st, yo and draw through 2 loops) 5 times, yo and draw through all 6 loops on hook. 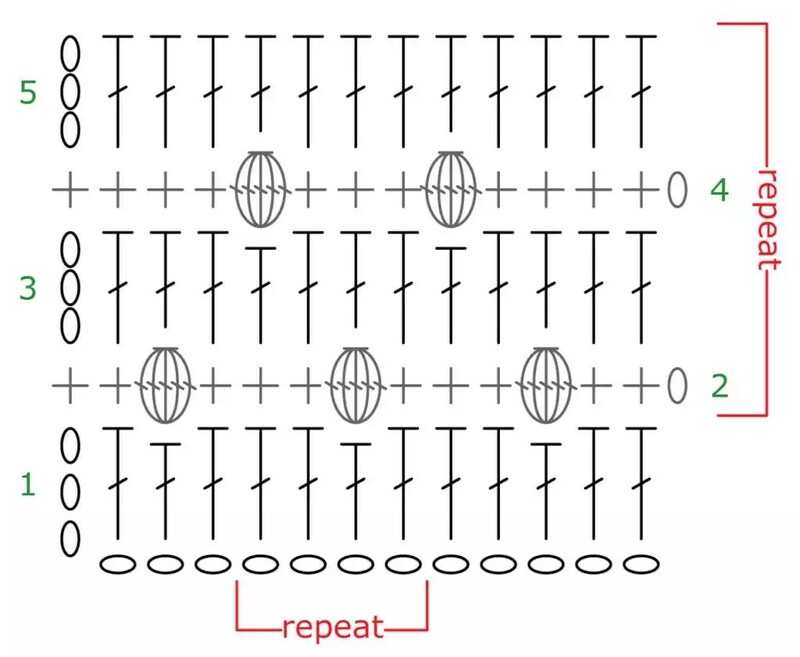 If you wan to use this pattern stitch for another pattern you need to know how many chains are used for the foundation. For the Bobble–Foundation chain is a multiple of 4 + 3. Designer NOTE: I fount this stitch to be pretty average for me. 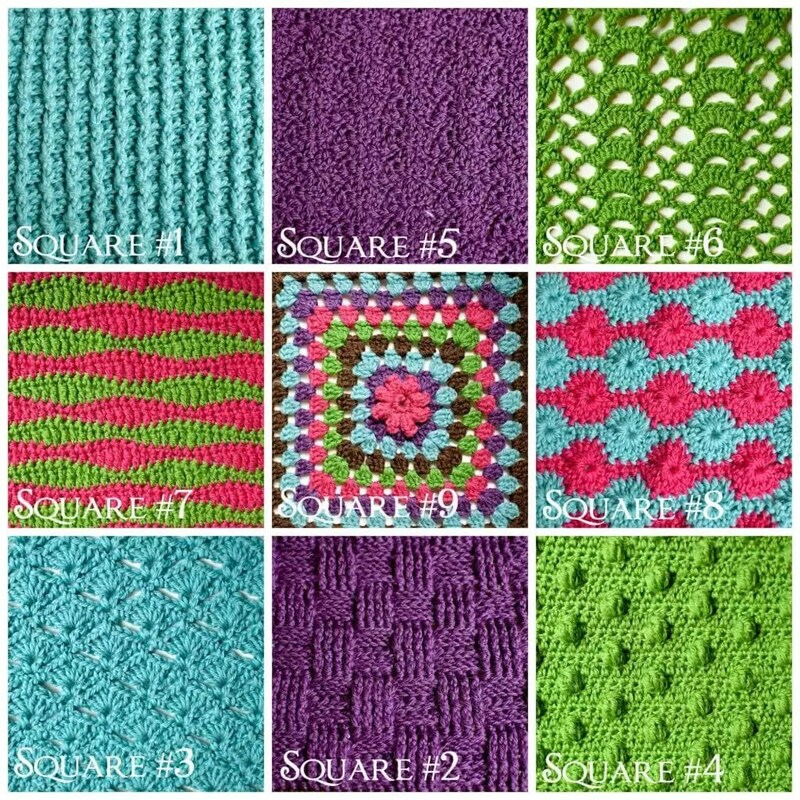 However, if your squares are turning out much bigger than my 11″ by 11″ this might be one of the squares you use a smaller hook for and/or adjust the beginning chain amount. Row 1 (RS): Skip 3 ch (counts as 1 dc), dc in each ch to end. Row 2: Ch 1, sc in each of the 1st 2 dc, bobble in next dc, *sc in each of the next 3 dc, bobble in next dc; rep from * to last 2 sts, sc in each of the last 2 sts, placing last sc in tch. Row 3: Ch 3 (counts as 1 dc), dc in each st to end. Row 4: Ch 1, sc in each of the 1st 4 dc, *bobble in next dc, sc in each of the next 3 dc; rep from * to end, placing last sc in tch. Row 5: Ch 3 (counts as 1 dc), dc in each st to end. Rep rows 2-5 only, ending piece after a Row 5. Designer NOTE: Are you bobble’s not popping off the fabric very well? Take a look at the HD Video to get a tip from me! For these charts you will notice that the numbers on the sides count the rows. You can also use these numbers to let you know from which side you will begin reading that row of the chart. For example: Row 1 will be read from the left to right. Each of the charts provided in this pattern are written with the same number of foundation chain stitches as the ‘in class block’. I did this so that you have a full chart that allows you to see exactly what stitches go where for the entire swatch. However, for this square I also am providing a chart showing the same number of foundation chain stitches as the ‘full size block’. I thought it would help you to see how many bobbles you should have at the end of the row if you are following my same numbers. Love this blanket. I would like to see a tutorial on how to finish the border. I love it with the ribbon trim. Please send me the tutorial link on how to complete the blanket.